Oregon woman inherits a 1944-D steel cent, does some research and with the help of a coin dealer discovers its true value. Sold at Florida United Numismatists (FUN) show to an online bidder. 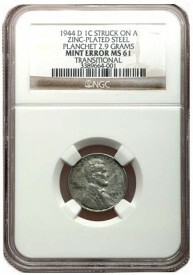 Coin graded by Numismatic Guaranty Corporation (NGC) one of the most trusted and renowned grading companies in the world.